During Ronald Reagan's political career, he popularized the so-called 11th Commandment: "Thou shalt not speak ill of another Republican." I don't often criticize Reagan but he was wrong on that one. The notion is that criticizing Republicans could aid the Democrats in winning the general election. Therefore, one should never criticize a Republican. Of course, Reagan spent most of his career running with little intra-party competition. (Reagan's loss in 1976 to President Ford was an exception.) It is easier to follow the 11th Commandment when you're the front-runner. Regarding the 11th Commandment, what about situations where the Republican has abandoned all conservative principles and is acting like a Democrat? A good example is Mayor Jim Brainard of Carmel. Brainard's administration has spent and borrowed money like, well, a Democrat. Should we Republicans overlook that spending because it is going chiefly to corporate welfare? There is no money tree in Carmel. The City has been able to keep spending at the rate it is because of annexations, increased commercial development and borrowing by the city and the redevelopment commission. Eventually that debt will have to be repaid and when that day comes the city's finances will come crashing down. Why shouldn't a Republican, someone who believes in conservative values, criticize one of the most liberal, big spending, big borrowing mayors in the entire State of Indiana? The fact Mayor Brainard chose to put an (R) by his name is because of the political realities of Carmel, not because of conservative values which he clearly does not hold. Obviously Brainard's challengers, City Councilman John Accetturo and Internet business owner Marnin Spigelman, have to make the case that the Brainard should not be re-elected. That involves criticizing Brainard and challenging his record, i.e. breaking the 11th Commandment and . If Accetturo and Spigelman truly believe Brainard has put the city on a disastrous long-term course (which I believe they are correct about), don't they have a responsibility to make that case not only as a Republican but as a resident of Carmel who cares about that community? Then you have Indianapolis Mayor Greg Ballard. Ballard was supported early on by tea party, anti-tax activists. Immediately upon election, Ballard turned his back on those folks, and has pushed through scores of tax and fee increases. He has also been a generous supporter of corporate welfare at the expense of Indianapolis taxpayers, despite the fact Ballard promised to bring an end to country club politics on Election night. There is nothing about Ballard's governing these past three years that suggest he is a conservative or a Republican. Unlike Brainard though, Candidate Ballard was more of an empty slate. Upon his election a swarm of profiteering Republicans seized control of Ballard's administration and have never let go. Ballard had a chance to position himself as a new kind of Republican, one that rejected the corporate welfare and insider dealing approach of previous Mayors such as Steve Goldsmith. That would have endeared himself to the working men and women of Indianapolis and skewed the political equation. Instead Mayor Ballard chose the Goldsmith model. Goldsmith though had a solid majority Republican base in the county and thus did not need a populist approach to win. Ballard though has a 45% Republican base in the county and cannot get to 50% through subtraction. So we Indianapolis Republicans, betrayed by the man who sold out our principles, are supposed to just not say anything because Ballard chose an (R) label? Why shouldn't we speak out when people around Ballard are using the Mayor to cash in and in the process inflicting long-term damage on the Marion County GOP? Over on another blog, a frequent Republican critic of mine frequently suggests that intra-party disputes should always be handled behind closed doors. I know from experience that does not work. People like David Brooks and Joe Loftus thrive when the disputes are kept behind closed doors. The only thing they fear is public exposure and the chance that other Republicans may discover they have sold out the future of the Marion County Republican Party for their own personal profit. I truly believe the Marion County Republican Party can eventually emerge as a successful, more populist party...a party which rejects corporate welfare and looks out for the best interests of the taxpayers. But that day will only come if we Republicans are publicly open and honest about our failures and insist on a new direction for our local party. This error pales in comparison to Reagan's having convinced Republicans that, as a byproduct of militarism, debt is good. Militarism was not the goal for Reagan. Defeating the former Soviet Union was the goal. Memory recalls that Reagan worked in one branch of the government. The current occupant of that branch has fed a gluttonous Congress. That debt porky branch is the same bicameral which ought now be cutting the fat from government, one hundred billion a whack. Of course militarism was not Reagan's goal. It wasn't Stalin's goal, either. Militarism is a means, not an end. Here we are, more than 20 years after the fall of the USSR, and the U.S. spends half of the world's military budget, and is now engaged in three wars of aggression where no military powers threatened America. We are far removed from the days when the right-wing carried the anti-imperialism banner, and Reagan was a key figure in institutionalizing the perpetual war state. 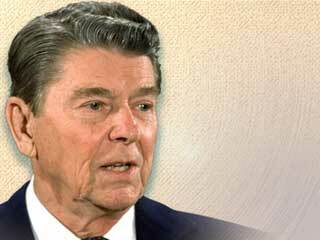 Memory recalls that Reagan had the same veto power as any other president. In eight years Reagan vetoed only 78 bills, compared to Gerald Ford's vetoing of 66 bills in two-and-a-half years (mostly to counter the economic disaster of the Republican president he replaced). A much more fiscally and constitutionally responsible president, Grover Cleveland, vetoed 414 bills in his two terms. Even Eisenhower vetoed 181 bills in two terms. But Republicans prefer that Reagan be judged by his rhetoric, not his inactions. Let's not pretend that Republicans want small government. They have had every chance to effect it, yet with years controlling of both branches of our wonderful civics book bicameralism, they grew government, grew regulations, grew taxes, and expanded the empire. Thank you very much for saying, what apparently so many other Republicans are afraid to do. As a Republican, I am ashamed to be a member of the same party to which Jim Brainard professes to belong. It is because of our failure, as individuals and collectively as a party, to call out and hold our own accountable, which leads to any disagreement with the Democrats, as being perceived as being purely political. Such a failure, leads the general public to see little difference between the two parties. Recently, Mayor Brainard went to Washington D.C. to lobby against the House Republican efforts to cut spending and eliminate the Community Development Block Grant program. Brainard was part of a group of 30 from the liberal USCM who went to DC in February to try and halt such cuts ......84% of the group were Democrats. Well Martin, your assessment of militarism makes sense, but recall also, that Reagan was actually responding to Soviet militarism- a real threat. Your assessment of Republicans (Democrat light), is fairly debt-on. Perhaps Reagan's scales were "Tipped" in veto matters. Here we are, with a nightmare President, principle free parties, but, but a public awakening, hopes for which we have are high. The US was no less militaristic than the USSR, and the US was spending far more money than the Soviets on "defense," The U.S. put more troops and arms into distant wars that engaged the USSR and the Chinese communists and their allies. The US repeatedly attempted to kill a Soviet ally, Castro, and to invade his country, though Castro and Cuba were no threat to the US. The Cuban Missile Crisis began with the U.S. installing mid-range nuclear missiles in Turkey, which understandably infuriated the Soviets. It ended with a secret deal for both the Cuban and American missiles in Turkey to be removed. Kennedy's willingness to risk the mass nuclear annihilation of Americans was utterly irresponsible. About a year ago I calculated today's combined military expenditures by the US and its allies, and they came to over 85 percent of all global expenditures. Despite that massive disproportion, Americans are less safe than we were at the height of the Cold War and our liberties far less secure. No American president has offered to make a deal with the Russians and the Chinese to eliminate all nuclear weapons directed by the nations at each other. Fealty to the military industrial complex is Reagan's most enduring legacy; especially since he utterly failed to achieve any of his stated objectives for reducing government size, intrusion and taxes. And he made government debt respectable to the Right. Reagan adopted the rhetoric of the Old Right, but he was an iconic neoconservative. He utterly rejected the non-interventionism of the Right, in favor of the internationalism of the liberals. Of course the Republicans had already moved in this direction in a big way -- with anti-communism as their rationale -- in Vietnam; but few people ever claimed that Nixon was a conservative. The embrace of Cold War military interventionism was the seed from which sprouted the neoconservatism which crowded out traditional right-wing ideology. Neoconservatives still gull their constituencies with Old Right rhetoric, but their actions are but slightly different than those of their ostensible liberal opponents. "Conservative" Republicans attack Obamacare by claiming that it will harm Medicare, the existing socialized medical scheme that the last Republican president expanded substantially. Reagan should just have said, "Party is more important than right and wrong" because it means the same thing.